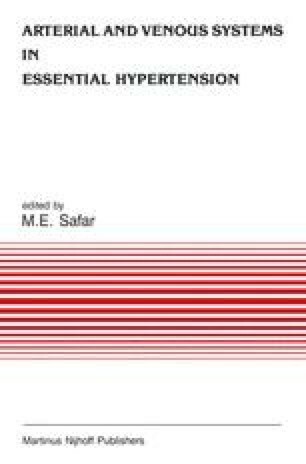 Because increased peripheral resistance is hemodynamically admitted as the primary cause of blood pressure elevation in essential hypertension , any antihypertensive drug might theoretically decrease peripheral resistance. This is the case of angiotensin converting enzyme (ACE) inhibitors which have been demonstrated to lower blood pressure through a fall in total peripheral resistance [2–3]. However, increasing attention must be also given to the action of drugs on the large arteries the distensibility of which is a major determination of the cardiac afterload  and of the arterial cyclic stress , two factors which strongly contribute in long-term to the occurrence of cardiovascular damage . Moreover, since the large arteries of hypertensive patients are the site of various abnormalities including an increase in arterial calibre , an increase in pulse-wave velocity [6, 7] and a diminution of arterial compliance [8, 9], it must be a primary objective of antihypertensive treatment to reverse these arterial changes. The reason is that correction of these alterations in hypertensive large arteries might help to improve prophylaxis against the atherosclerotic complications of the disease. Thus the response of the large arteries to antihypertensive treatment represents a line of pharmacological research that should be followed up in the coming years. In this respect, the effects of two angiotensin converting enzyme (ACE) inhibitors (captopril and enalapril) have been studied on large arteries of essential hypertensive patients.